Nineteen students at UC Davis who were pepper-sprayed during a peaceful sit-in last November have filed suit against UC Davis. The suit, being handled by the American Civil Liberties Union, charges the university with violating the students’ civil rights. The UCD Academic Senate rejected a motion of no confidence in the chancellor last week, but did condemn the police action. Students at UC Berkeley continue their Occupy activities, often focusing their protests on library service cutbacks. 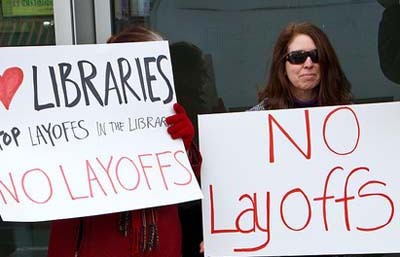 Similar demonstrations are happening at other universities, including Harvard, where students, staff and faculty occupied a library café for 5 days in mid-February to protest staff reductions as part of a top-down reorganization of library system. Other activities at Harvard include several rallies and a picket against the library administration, as well as two petitions supporting library staff and librarians. Another national day of action for education is planned for this Thursday, March 1. Students, staff and teachers also plan a day of action in Sacramento on Monday, March 5 -- learn more, and sign up for a seat on the bus here. California Watch reports that minority enrollment has dropped at the University of California as a result of the 1996 approval of Proposition 209, which prohibits affirmative action in education. Despite efforts by the university to diversify the student population, the number of minorities has never recovered its pre-209 levels. The gap between graduations of minority students from high schools and admissions to the university has also grown. More change could be coming: the US Supreme Court agreed last week to hear what could be a precedent-setting case on affirmative action in higher education. UC president Mark Yudof addressed the Vacaville Rotary Club last week, warning that disinvestment in the university hurts California. However, others are happy to invest in UC. Dow Chemical, now marketing itself as a leader in sustainability and green chemistry, gifted the UC Berkeley College of Chemistry through its company foundation with $3.5 million to "rebuild the college's aging undergraduate teaching labs and design a new curriculum." And the Wall Street Journal reports that the UC "system had no trouble selling an $860 million taxable bond offering" to institutional investors that requires them "to lock in their money for 100 years." State senator Leland Yee has introduced legislation to reform the California State University Board of Trustees and make it more representative of the university it governs. It would specifically designate 9 of the 25 trustees to be students, faculty, or workers from within the university system.